sired institutional changes to be sustained. long history, but have not been documented or well understood. ture and existing rewards structures (Frank & Shapiro, 2007). can be encouraged and what role top down leaders can play. 0227325 a warded to Nancy Shapiro. D. B. MAY ET AL. and the institutionalization and sustainability of these reforms. change in institutional culture to be sustainable. leaders may still be important to support bottom up leadership. policies, and increased fiscal and human resources. unique cultural context of shared governance (Peck, 1983). provide background on this area, which we review next. Beach, Finkelstein, & Larson, 2008, for a recent synthesis). and institutional culture and context. individual schools in 30 states and Puerto Rico. project participants themselves (i.e., faculty and administrators). 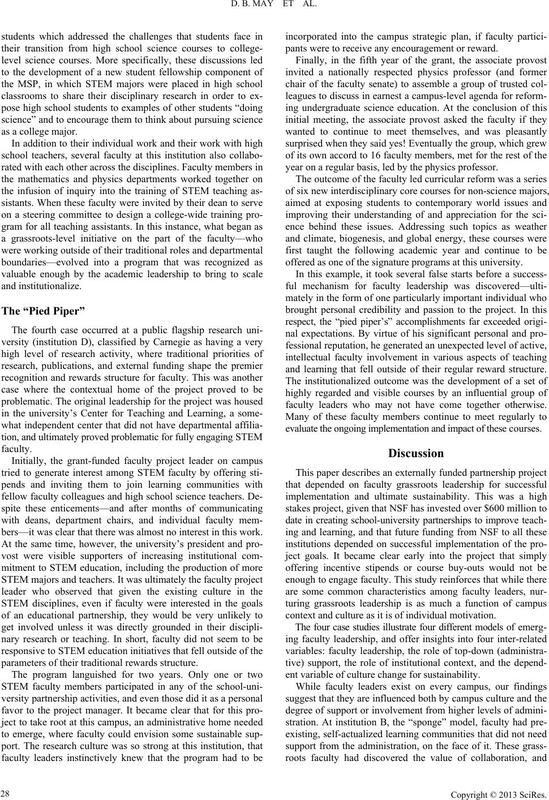 faculty, and deans; and a project-wide social networking study. to contribute to processes and outcomes across the four settings. leadership efforts in each setting. and learning seminars and faculty professional development. productive strand of faculty activity would not have developed. almost 70% of the science faculty at the institution. tions which secured additional external funding for their work. leader), these collaborations have continued to grow and evolve. (through deans) to sustain their work. erwise may have re mained dissipated across the campus. munities also received financial support to continue their work. ing teaching skills among undergraduate STEM majors. gained some of its standing. often marginalized, and struggle to sustain their focus over time. leadership that makes positive contributions to the institution. as well as the expansion of its research agenda. bers—it was clear that there was almost no interest in this work. parameters of their traditional rewards structure. pants were to receive any encouragement or reward. year on a regular basis, led by the physics professor. offered as one of the signature programs at this university. and learning that fell outside of their regular reward structure. faculty leaders who may not have come together otherwise. evaluate the ongoing implementation and impact of these courses. context and culture as it is of individual motivation. ent variable of culture change for sustainability. and make progress toward the grant goals. by the research priorities of the university. curricular reform of the sort that was expected by the funders. shelter for their initial advances into faculty leadership roles. sustainable program of outreach to the public schools. and, ultimately, the degree to which it was sustained over time. 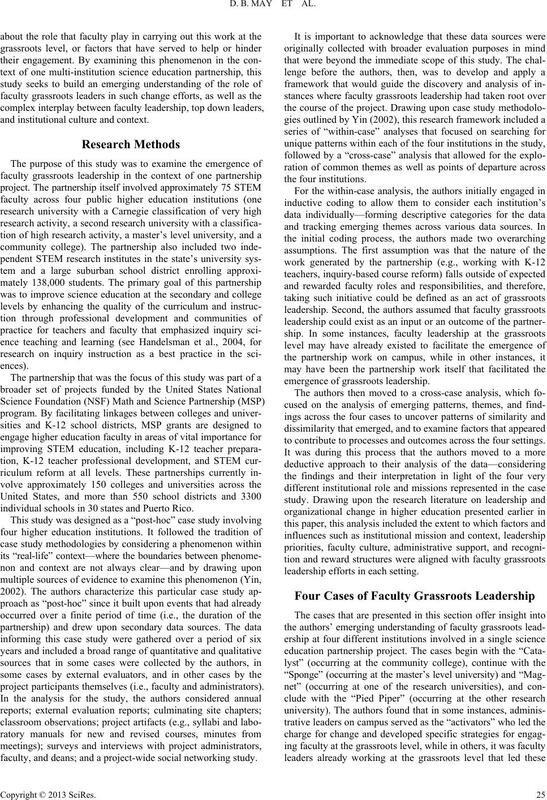 of the four faculty grassroots leadership cases. 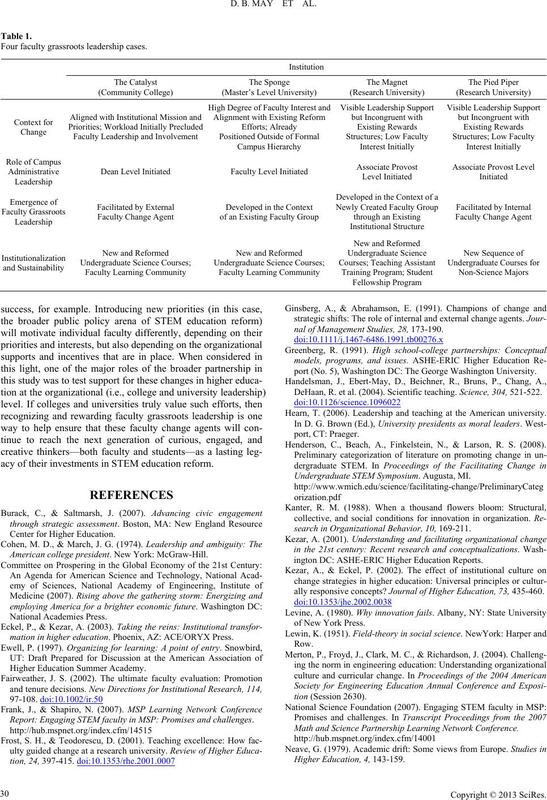 ciated roles in which higher education faculty typically engage. that is typically undervalued on a college or university campus? 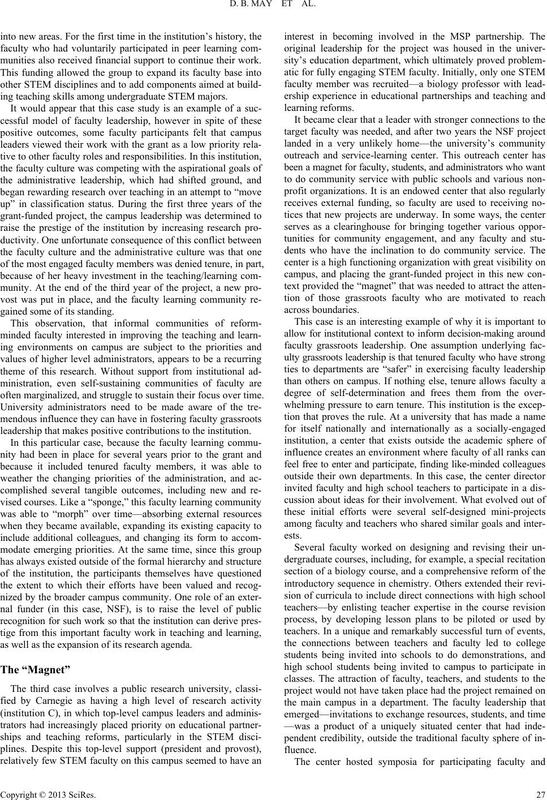 Four faculty grassroots leadership cases. acy of their investments in STEM education reform. Center for Higher Educa t i on. American college president. New York: McGraw-Hill. mation in higher education. Phoe nix, AZ: ACE/ORYX Press. 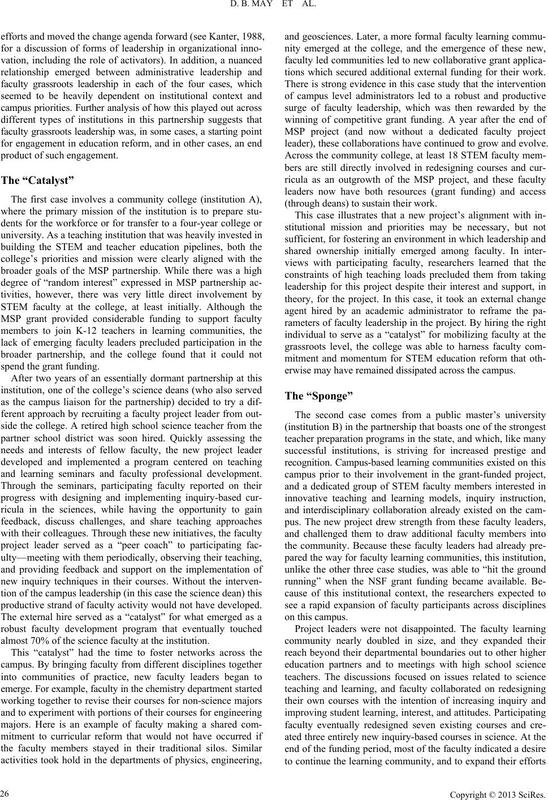 Report: Engaging STEM faculty in MSP: Promises and challenges. nal of Management Stud ies, 28, 173-190.
port (No. 5), Wa s hi ng to n DC : The George Washington University. DeHaan, R. et al. (2004). Scientific teaching. Science, 304, 521-522. Hearn, T. (2006). 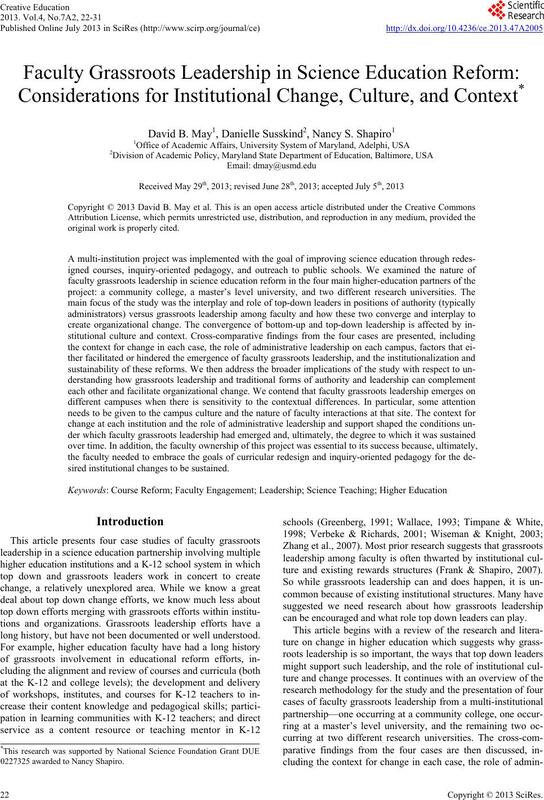 Leadership and teaching at the American university. 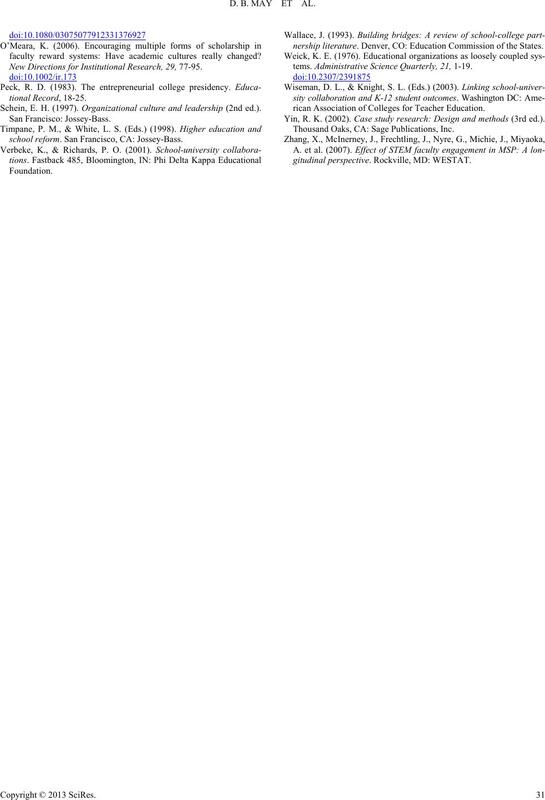 Henderson, C., Beach, A., Finkelstein, N., & Larson, R. S. (2008). Undergraduate STEM Symposium. Augusta, MI. search in Organizational B ehavior, 10, 169-211.
ington DC: ASHE-ERIC Higher Education Reports. ally responsive concepts? 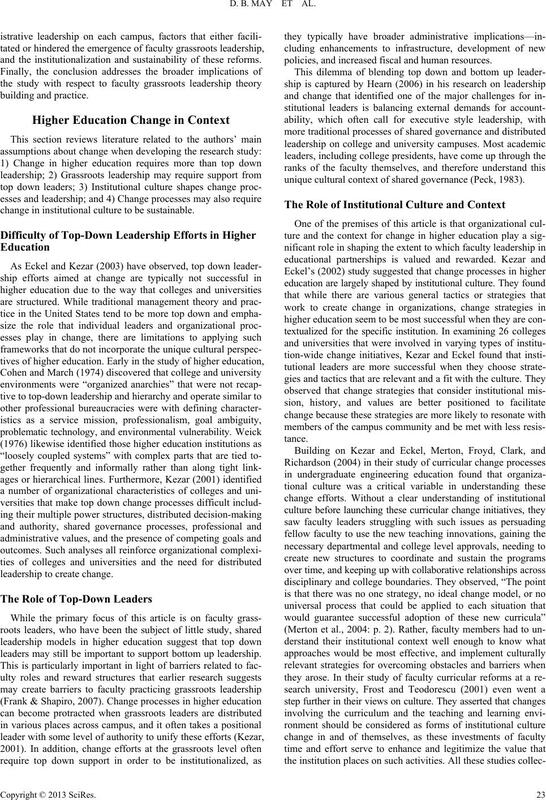 Journal of Higher Education, 73, 435-460. Math and Science Partnershi p Learning Network Conference. faculty reward systems: Have academic cultures really changed? 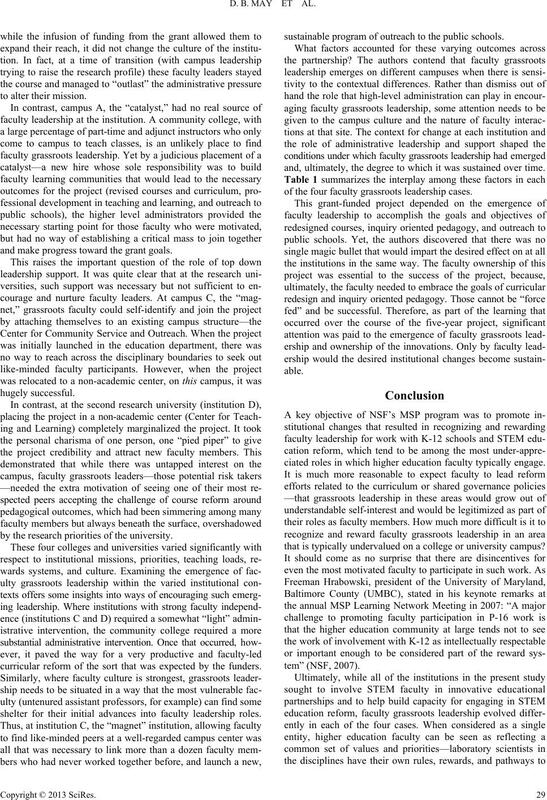 New Directions for Institutional Research, 29, 77-95. Schein, E. H. (1997). Organizational culture and leadership (2nd ed.). school reform. San Francisco, CA: Jossey-Bass. nership literature. Den ve r, CO: Education Commis si on of t h e St at e s.
tems. 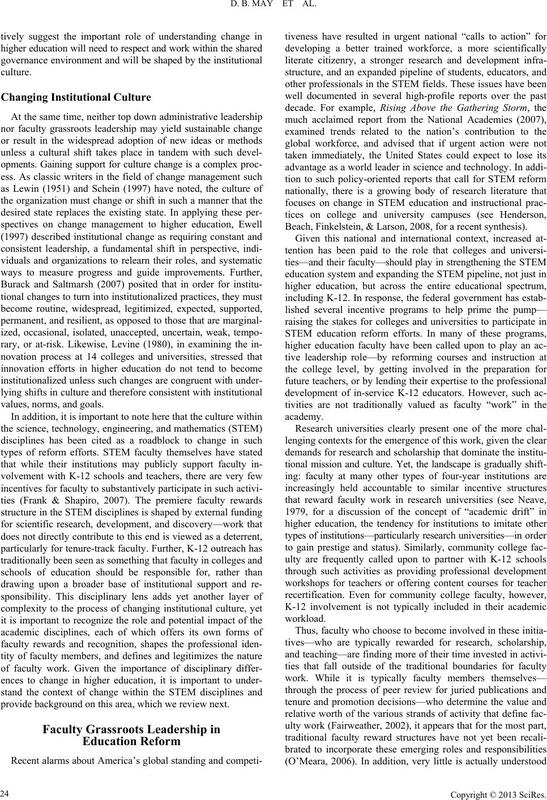 Administrative Science Quarterly, 21, 1-19.
rican Association of Colleges for Teacher Education. Yin, R. K. (2002). Case study research: Design and methods (3rd ed.). gitudinal perspective. Rockville, MD: WESTAT.